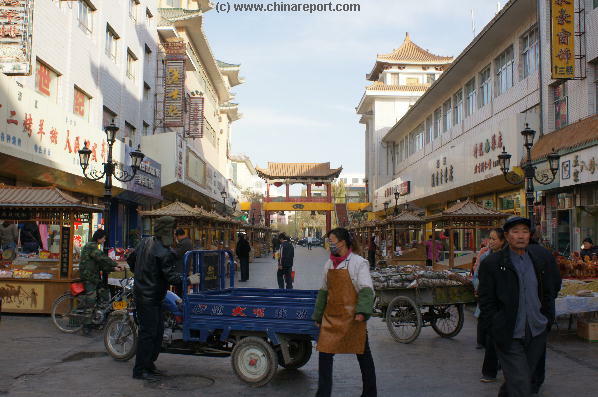 Leading away Eastward from Shazhou Central Square is YangGuan Dong Lu, the Main Eastern thoroughfare of Dunhuang City. 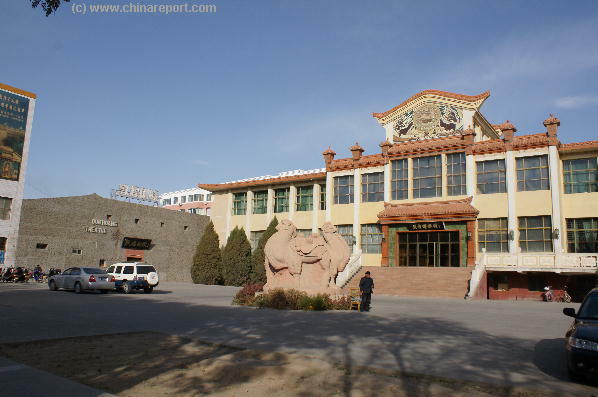 Follow YangGuan Dong Lu Eastward to pass Shahzhou Night Market, the Dunhuang Museum, it's Luminous Jade Cup Factory, the Xinhua Book Store and Hotels. As the main connection to the East, YangGuan Dong Lu leads away from City Centre towards the (former) Eastern Gate. 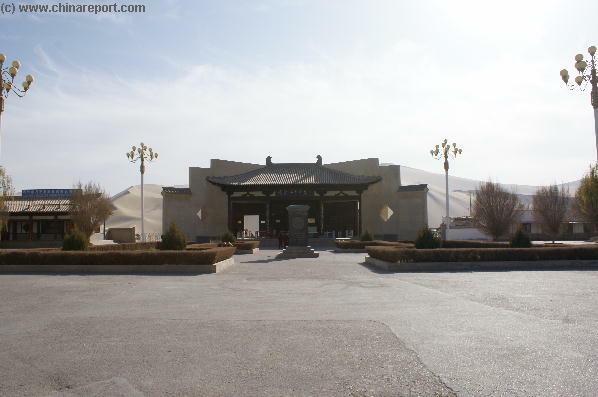 After leaving the East Gate the street connects to a highway and the Dunhuang Railway Station, the Airport and Mogao Caves. Follow South Street or Mingshan Lu from the Centre of Dunhuang untill it's termination point in the very South outside of Dunhuang at Sighing Sands Mountain (Mingsha Shan) and nearby Crescent Moon Pool. Scattered along the length of this main South Boulevard in Dunhuang are the CITS Travel Service, next the Main Bus Station of Dunhuang, then the Police Station, and after crossing a major artery of the Cities' irrigation system - Farms, the Silk Road Dunhuang Hotel, various odd Museum and the Sand Dunes of Mingsha Shan where the Crescent Moon Spring is hidden. 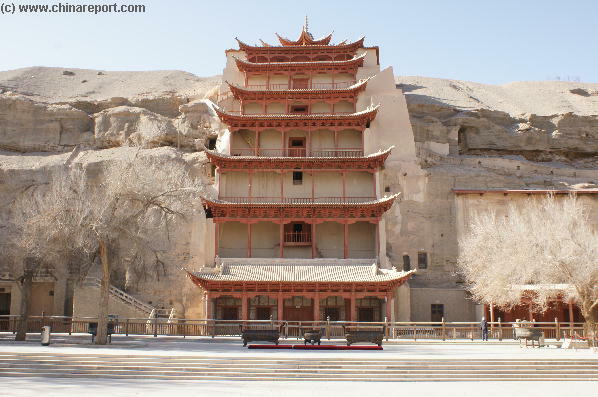 Located due East of the Mogao Caves complex Sanwei Mountain is one of the lesser visited places near Dunhuang. 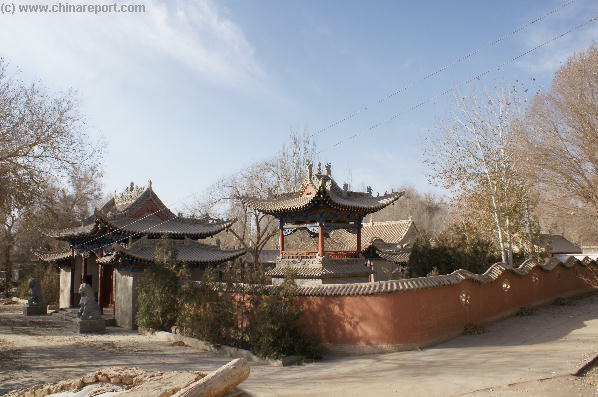 At a relatively small distance driving out of Dunhuang, some 18 kilometers some of which along a treacherous road through ravines and underneath steep cliffs and rock-falls Sanwei Mountain Valley and Temple Complex offer a rich reward for visitors. 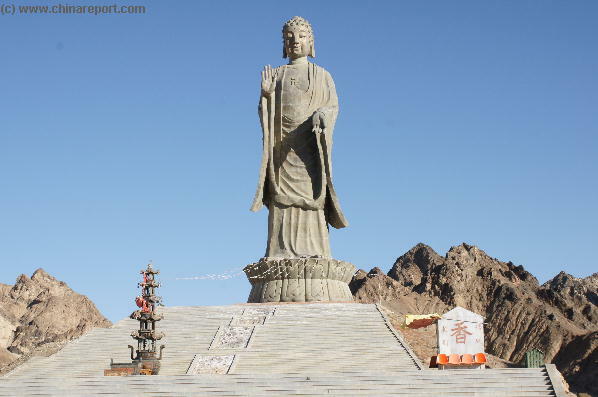 Admire the GuanYin Well Buddhist Temple Pavilions and their Murals, pray at the Multiple Altars and then come face to face with Sanwei Mountain's Gargantuan Guanyin Buddha Statue ! 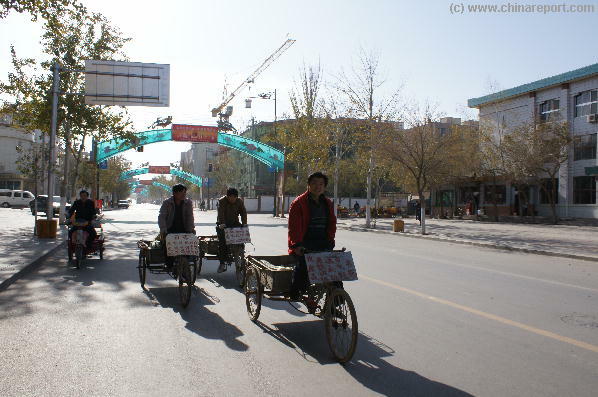 Take a Tour along the lenghty main Western Boulevard out of Dunhuang Town. Leading away westward from Central Shazhou Square West Street is the location of the Main Post Office, the Bank of China, City Hall and a number of Hotels. 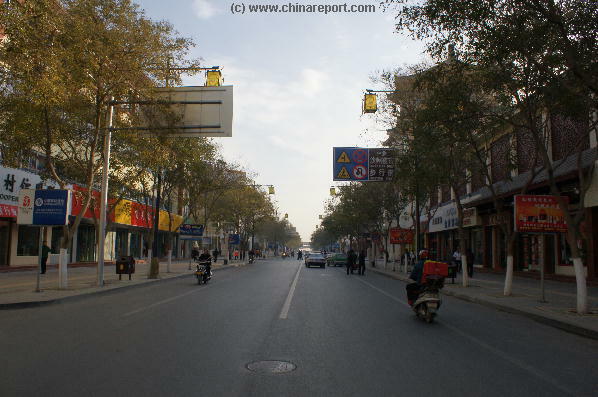 Among the roads and sites reachable easily from West Street - YangGuan Zhong Lu, are Mingshan Lu - the Main Boulevard leading South and the Ancient Open Market Street. Located farther away on West Street, across the River Dang, are an ancient Fire-Beacon of the Great Wall of China and White Horse Temple. And that is not all ! 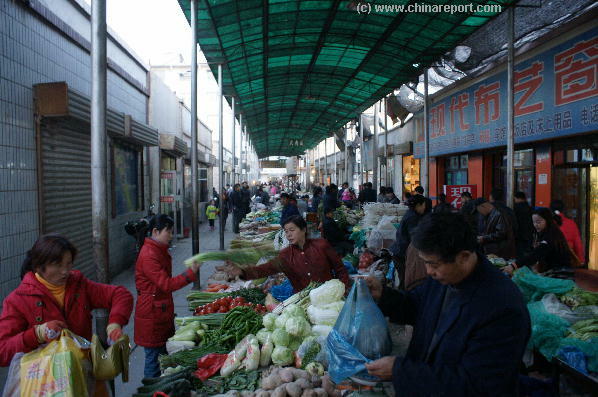 As can be derived from it's name, West Street continues for some 80 kilometers, all the way to YangGuan Pass. 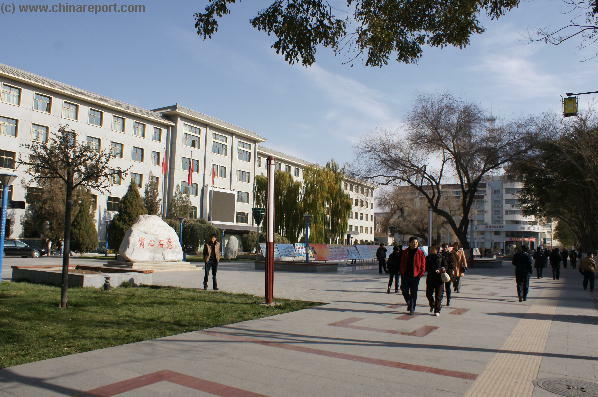 The Modern Central Square of Dunhuang is named Shazhou, after the ancient first name of the City of Dunhuang in History. 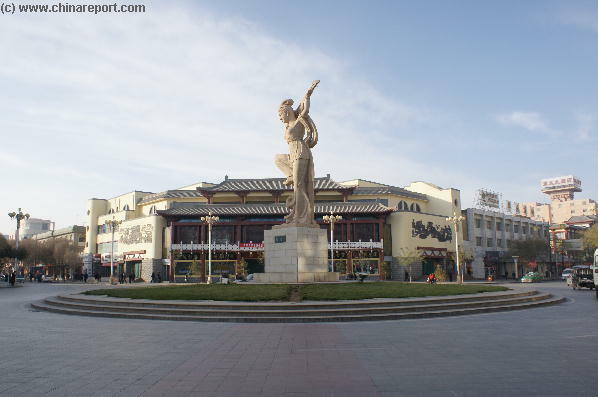 Apart from a modern sculpture of a Flying Apsara, the virtual city Logo of Dunhuang, the Central Square offers a large Store as well as several smaller Ones. Well-placed on various points on raods leading away from the Square are the Shazhou Night Market, several Hotels, the China Post Central Post Office and the Bank of China. 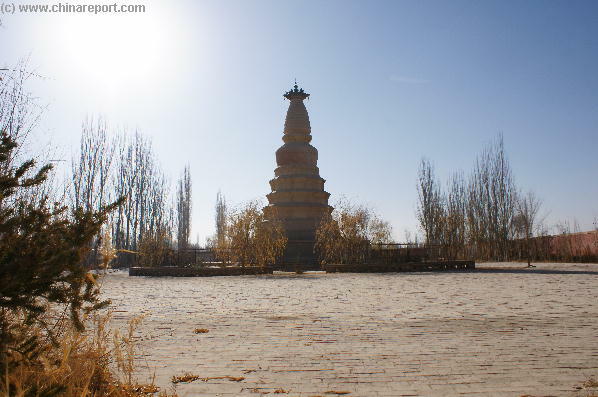 Owing much to its remote location, the negative local situation for agriculture and the roughness of the surrounding terrain, the size of the City of Dunhuang has been relativily small during most of its History. 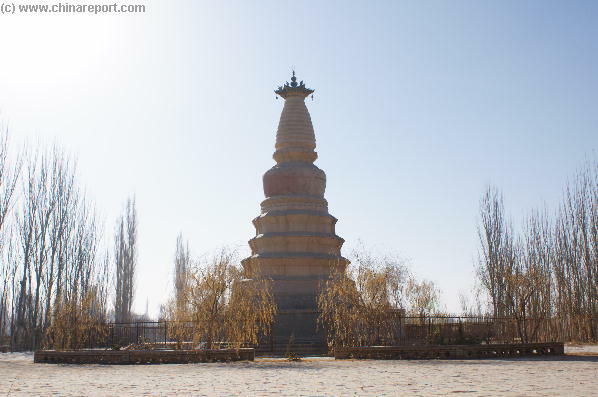 The ancient Fourth Century Dagoba of the White Horse, about a mile west out of Dunhuang. A Dramatic Landscape awaits at Mingsha Shan Sand Dunes and the nearby wonder of the Crescent Moon Spring. Among the Top Attractions of Dunhuang, Mingsha Shan Dunes reach well over a 100 meters in height and dominate the horizon South of Dunhuang Town. Head to the sand dunes on Camel-back by Guided Tour, rent a Jeep or Quad, or be a champ and challenge the Sands on Foot ! Miles of Sands await in between of which lies the hidden Crescent Moon shaped Spring and Temple Pagoda, a unique architectural treasure of western China. Have a blast and make a fly-over by ultra-light ! Get away from Tourist Ventures, Tour-groups, Time Schedules and Earthly Luxuries to explore the Desert Tombs of Dunhuang. 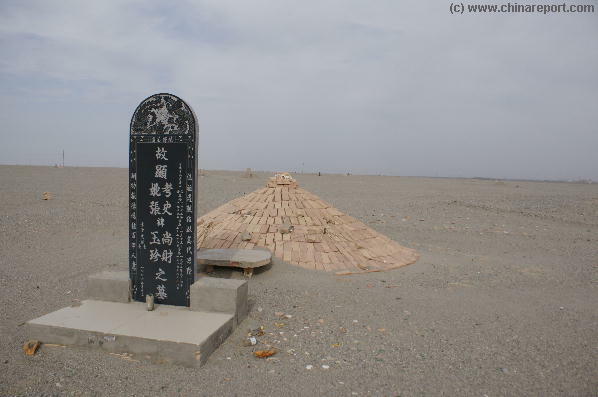 Located far out of town, due West of the new Dunhuang City, the Western Cemetary offers a getaway from it all. Stand in the rocky desert between wind-and sand-swept tombs of former inhabitants. 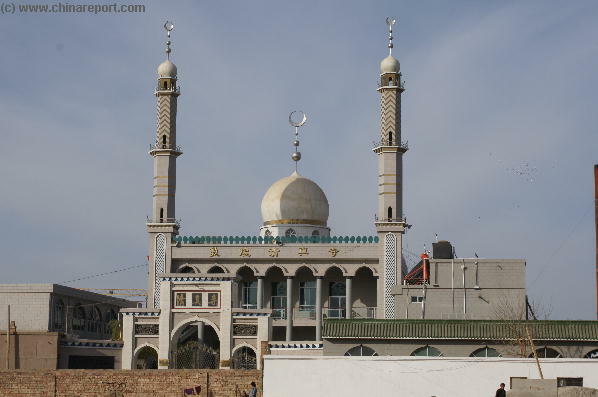 Still active, the western cemetary is among the largest cemetary sites scattered around Dunhuang's Town and Farms. It also offers an unprecendented experience of desert isolation. Rated by Many as a disappointed the small Dunhuang Museum on East Street is so far the only Museum to be located inside of Dunhuang Town. Admire the modernized front of the Museum and/or browse around inside the relish at the examples of early archeological finds in and around the City and catch up on some history of the Silk Road in which Dunhuang was a vital, vibrant and strategic Oasis stop-off savagely contested between rivaling Civilizations. 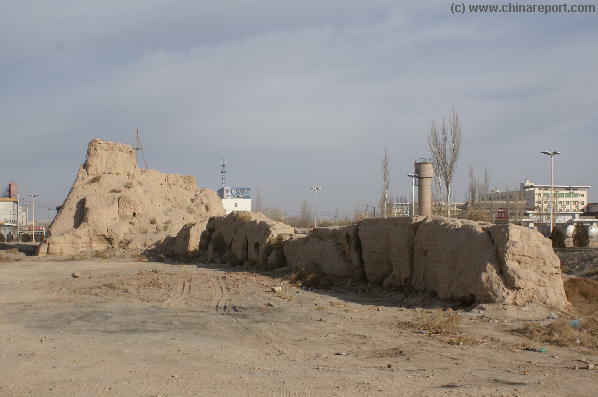 A Remnant of the Han Dynasty Era defenses of the strategic city of Dunhuang, the Fire-Beacon and Tower on West Street is only one of many such structures in and near Dunhuang. West Street however provides a good location to visit one un-protected and unrestored example of these 2000 year old beacon towers. 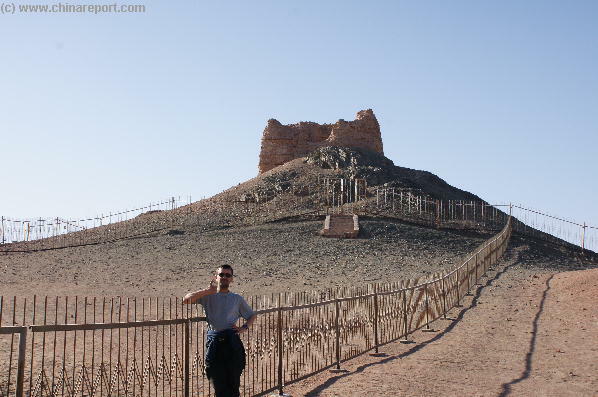 When Dunhuang City was the "mounth" on the beginning of the "neck" of China the city was strongly garrisoned and troops were stationed along the silk road path in these reinforced towers whose fire-beacons connected up with the Great Signal carried on the Great Wall of China. Constructed between the Northern Wei Dynasty and the Tang Dynasty Era, the Western 10 Thousand Buddha Caves at Dunhuang are the western equivalents of the Mogao Caves. Hidden away in the Dang River Ravine, just of South of the extenses of West Street - YanGuan Zhong Lu and located a considerable distance out of Town the Western Caves are a must visit for those who are intend on seeing all Buddhist Cave Art, or those eager to experience it all. 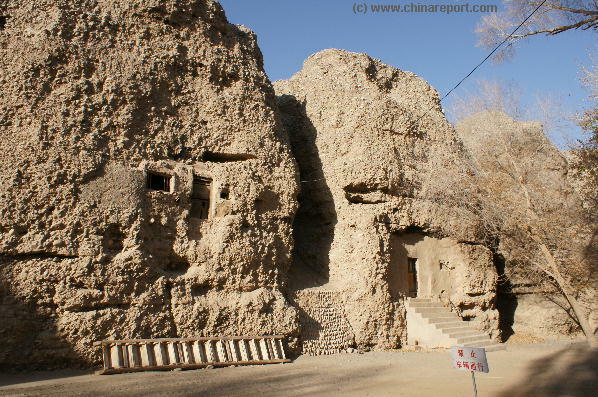 Apart from a relatively small number of Caves that are accesible on site (during seasons), the Ravine itself carries the Dang River eastwards into Dunhuang. The spectacular cliff faces as well as ancient Cave Home remnants make the Site an eery place. 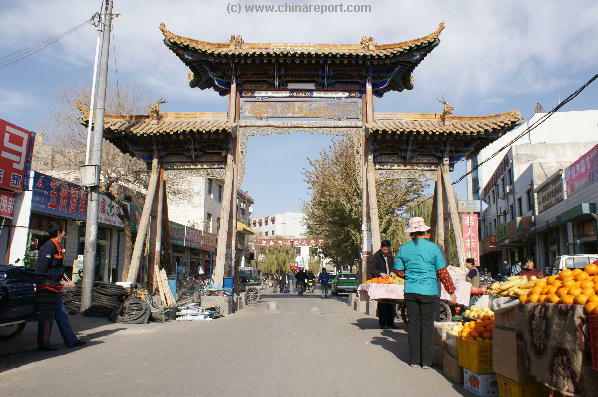 Dating from the Han Dynasty Era, the Jade Gate - Yu Men has been part of Dunhuang and it's History for 2000 years. Head far out into the Taklamakan Desert, a 102 Kilometers to the North-West, to visit the Jade Gate Toll-House at the Cang River. 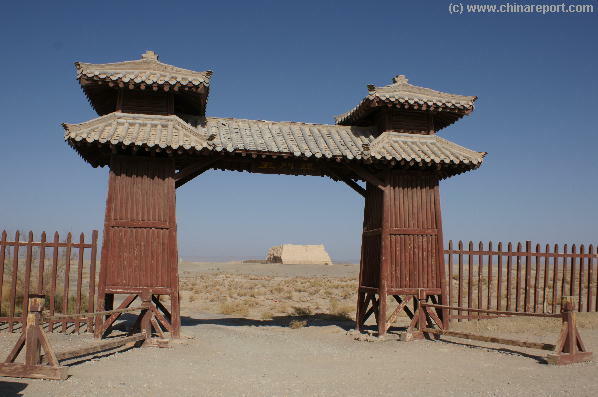 The Jade Gate marks the beginning of the North Route of the Silk Road around the Taklamakan Desert leading through Turpan Oasis eventually to end up at Kashgar and is considered to be the First Gate Under Heaven in the West on the Great Wall of China. 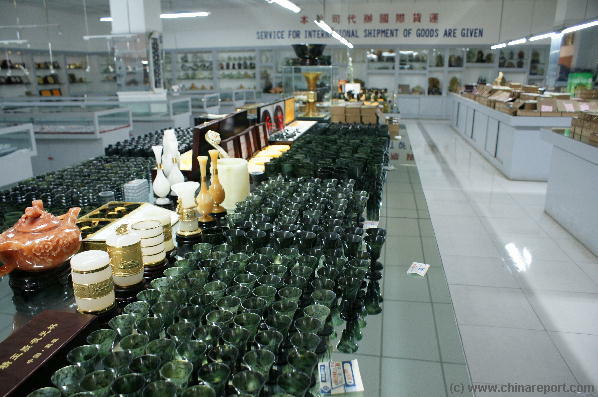 Located halfway between Shazhou Square and the Eastern City Gate of Dunhuang stands the Cities' Luminous Jade Cup Factory of East Street - YangGuan Dong Lu. Or so it is called. As is not uncommon in the Chinese Tourist Industry, this building on East Street mainly caters to the needs of Foreign and other Tour-groups with a desire to witness the production process of luminous Jade items. Not really a high output factory, the Facility does feature a spacious show-room where many of these unique Dunhuang Gift Items are on display and available for sale. The Beacon and Fortress of YangGuan, the Sun Gate are the counterparts of the Jade Gate (YuMen). Both together marked the "Mouth of China" , the western end of the Hexi Corridor, a strategic mountain route leading directly east and down into the fertile Chinese Heartlands. 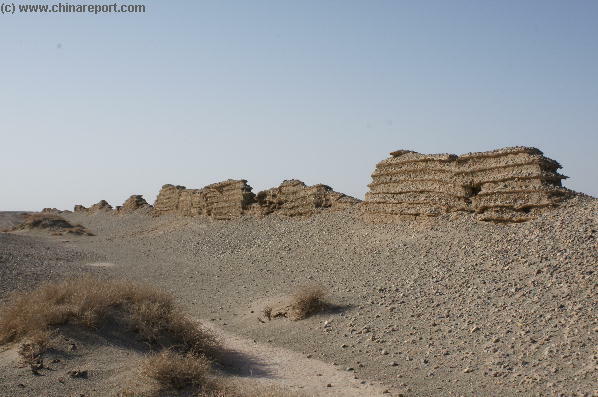 During the Han Dynasty the Great Wall of China extended as far West as these two points which are located due West of Dunhuang looking out on the Sands and Barren Lands of the Taklamakan Desert. 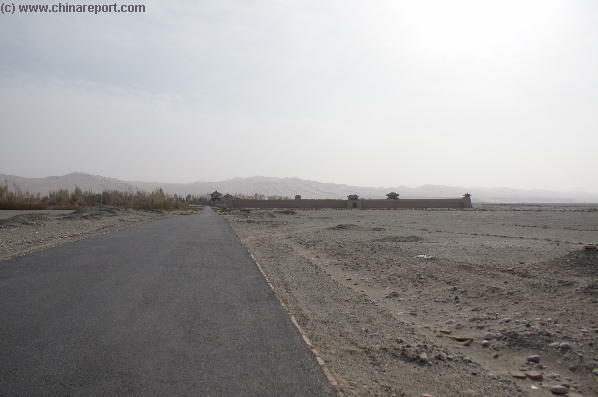 Beyond Sun Gate lay the Silk Road South Route, for which the Fortress provided protection and the Beacon was a guiding point. Rated by as the Top Buddhist Art in the World ..